I know I'm late to this party, but that's not necessarily a bad thing. After enjoying chef George Mendes' work at Tocqueville, I enjoyed his first starring role so much that I reviewed Aldea repeatedly (in 2009, '10 and '11). Why so tardy then in visiting his first follow-up, Lupulo, which opened on the ground floor of the Eventi Hotel last year? A couple of reasons. Not much more than a parade of anonymous sports bars, mediocre music venues, and inexpensive Indian restaurants. But you still need to go there from time to time, not least to catch shows at the estimable Poisson Rouge. So it's good to have a better bar in your back pocket. 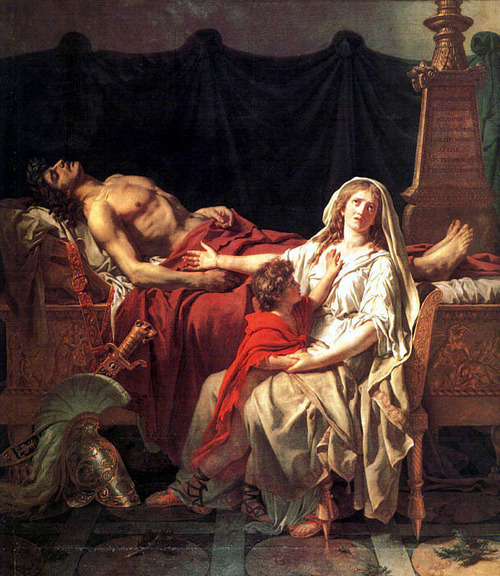 Off to the Dahesh, that too easily overlooked museum, in its lovely bi-level space in midtown, to see European paintings celebrating the legacy of Homer--including David's dramatic "Andromache Mourns Hector"--as well as some Daumier lithographs. The next day, to John Doyle's curious revival of Sweeney Todd, in which the performers--Michael Cerveris and Patti Lupone among them--carry musical instruments through the show. Not sure about it (it definitely didn't work with the same director's Company a few years later. I did eat out too. "We go back a long way," Marco Canora reminded me. "Twelve years." It seems only yesterday that Hearth, on the corner of East 12th and First Avenue, celebrated it's tenth anniversary, but in fact that was November 2013; and to my amazement, it's probably a couple of years more than that since I've eaten here. There's always the chase to the next new place, of course, but I'd enjoyed Hearth solidly from its early days--when people were still surprised that a fine dining chef would open a joint in the East Village--it predates the first Momofuku by two years, Degustation by three--to the last time I showed up at the chef's counter for a fine duck dish, and a complementary taste of a duck liver pâté the restaurant was fine tuning. When I saw the news of a major menu overhaul, it was time to go back. Some of you will already have heard the story of my first visit to Rao's, the legendary Gilded Age Italian restaurant in East Harlem. For those who haven't, here it is. But first, what else was I doing, middle of January, ten years ago. Well for one thing, I was reading some classic food writing--Josef Wechsberg's book on restaurateur Henri Soulé, Dining at Le Pavillon, and uncollected pieces by A.J. Liebling in the New Yorker archive. Well, I'm not even going to talk about the name of the restaurant in this week's review. I wouldn't know where to start. Suffice to say, the food is much better than the name. Your favorite New York vegan? Pure Food & Wine (which was also raw) vanished into a black hole. Blossom was about the most elegant option--the furthest from brown rice in a bowl--when it opened, but that was a while back (and it's now a mini chain). Dirt Candy, of course, can adjust from vegetarian to vegan. Sometimes my journal puzzles me. I dined, a couple of nights before New Year's Eve 2005, at a venue identified only as "BdV" [sic]. Since I had drinks first at Jimmy's Corner and Smith's, we can assume it was probably a place in midtown. Bottega del Vino fits the hastily scribbled acronym: but look at the food. Winter squash soup, shrimp with harissa and cucumber, roas poussin, lamb chop with mashed potatoes; and a bottle of '97 Mercurey.